English tenor Matthew Minter was educated at The Windsor Boys’ School where he excelled in Music. His undergraduate studies in Music were at Salford University, after which he continued to study singing with Nicholas Powell at the Royal Northern College of Music. 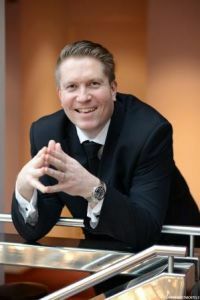 Renowned for his versatility as a soloist, Matthew is in demand throughout Britain and on the international concert platform where he has received critical acclaim for his communication, delivery, and clarity of text: “When Matthew Minter sang we were transported to a heavenly place”. Matthew works regularly with many of Britain’s leading orchestras, including The English Symphony Orchestra, Northern Sinfonia, Royal Liverpool Philharmonic Orchestra, Royal Philharmonic Orchestra, and has had the privilege of working under the direction of such distinguished conductors as Pierre Boulez, Sir John Eliot Gardiner, Bernard Haitink, Richard Hickox and Sir David Willcocks. Recent concert appearances include Bach’s St. John Passion, Coventry Cathedral; Bach’s Matthӓus Passion, Oude Kerk Den Haag; Handel’s Messiah, Wells Cathedral; Kodảly’s Missa Brevis, Concertgebouw Amsterdam; Mozart’s Requiem, St. John’s Smith Square; Orff’s Carmina Burana, Cheltenham and Verdi’s Requiem, Nieuwe Kerk Eindhoven. Concert engagements during the current season include the Bach Passions, Messiah, Creation, Mozart’s Requiem and Rossini’s Petite messe solennelle. In 2013 Matthew premièred and recorded a Mass of Reverence and Devotion written especially for his voice by Daniel Gillingwater and he will tour the UK with this work during 2016. Further career highlights to date include a gala concert performance for the current Prime Minister of Great Britain, singing at a private party for the Duchess of York and various members of the British Royal Family, and notably appearing on the BBC’s Top Gear programme performing O Sole Mio whilst being driven in a Maserati sports car by the seven time Formula1 world champion Michael Schumacher!